Today I found out Hall of Famer Richie Ashburn once struck a spectator twice in the same at bat with foul balls, the second time as she was being carried off on a stretcher. The event happened on August 17, 1957 during a game between the Philadelphia Phillies and the New York Giants. The spectator was Alice Roth. Roth was the wife of Earl Roth who was an editor for Philadelphia’s Bulletin newspaper, which Ashburn himself would later write for, along with the Philadelphia Daily News. During the at bat, Ashburn hit a foul ball that struck Roth squarely in the face, breaking her nose. The game was then paused as medics came in to tend to Roth. As they were carrying her away on a stretcher, play was resumed and Ashburn fouled off the first pitch thrown to him. This foul subsequently struck Roth as she was being carried off by the medics. From that game on, Roth chose to sit in the left field bleachers, far away from any potential foul balls. Roth and Ashburn became friends after that and Roth’s son eventually got to be a batboy for the Phillies. Ashburn, by the way, went 2-4 in that game with a double and a single. The Phillies ended up winning it 3-1. 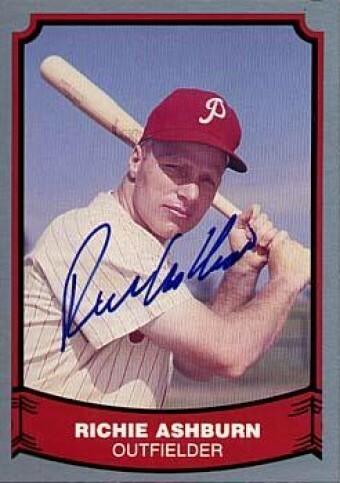 After his playing career was over, Ashburn became an announcer for the Phillies starting in 1963, a job which he kept until 1997. He had planned to retire in 1997, but he died of a heart attack after a game against the Mets at Shea Stadium on September 9, 1997. While announcing during home games, Ashburn would sometimes ask if anyone from nearby Celebre’s Pizza wouldn’t mind sending him over a free pizza. Because Celebre’s was not an official sponsor of the Phillies, the organization made him stop. To get around this, he would sometimes include with the birthday/anniversary wishes things like: “…special birthday wish to the Celebre’s twins, Plain & Pepperoni” to try to get them to send him a pizza. Ashburn was the last Philadelphia Phillie to get eight hits in a single day (during a double header on May 20, 1951). He hit eight singles on the afternoon, going 4 for 6 and 4 for 5, with one walk in each of the games and two RBIs apiece. The Phillies lost the first game 3-5 and won the second 9-5, both were against the Brooklyn Dodgers. Ashburn’s longtime announcing partner and hall of fame broadcaster Harry Kalas also died from heart problems. Rather than after the game like Ashburn, Kalas collapsed in the press box shortly before a game between the Nationals and the Phillies on April 13, 2009. In tribute to Ashburn, the Phillies have named the center-field entertainment area “Ashburn Alley” at Citizen’s Bank Park. They also named the radio broadcast booth “The Richie ‘Whitey’ Ashburn Broadcast Booth”. The former of these was named such after fans called for the stadium itself to be renamed in Ashburn’s honor, he having devoted 47 years of his life to the Phillies. Ashburn was an above average hitter compiling a lifetime line of a .308 batting average and a .396 on base percentage. He also was known for being an exceptional defensive center fielder. Also in 1957, the Dodgers purchased an airplane to fly their team around during the season. This made them the first ever Major League Baseball team to do so. Whitey was a great athlete. He was an all-state running back. He won the Nebraska state High School 100 yard dash. While in Philly he won the state racquet ball championship. He was a fist class tennis player. As I recall, he retired with the best Center Field fielding percentage in the history of baseball.